The core LANSCE facility is one of the nation's most powerful proton linear accelerators, LINAC. The LINAC's capability to reliably deliver beam current is the key to the LANSCE's ability to do research–and thus the key to meeting NNSA and DOE mission deliverables. 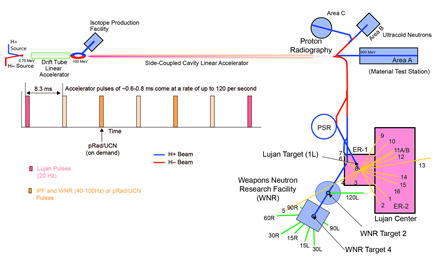 The 800-mega-electron-volt (800 MeV) LINAC provides beam current, simultaneously, to five major facilities with unique capabilities: the Proton Radiography facility that supports National Nuclear Security Administration Defense Program (NNSA DP) missions; the Weapons Neutron Research facility (WNR) that supports DP missions; the Lujan Center that supports DP and Department of Energy (DOE) Office of Science (SC) missions; the Isotope Production Facility (IPF) that supports the DOE Office of Nuclear Physics within the SC; and the Ultracold Neutrons (UCN) facility that supports SC missions. The first stage of the accelerator contains injector systems for each kind of particle (H+ and H-). Each injector system has a 750-keV Cockroft-Walton generator and an ion source. The two ion sources produce H+and H- particles inside high-voltage domes. After they leave the injector, the two ion beams are merged, bunched and matched into a 201.25-MHz drift-tube linac for further acceleration to 100 MeV. The third and longest stage of the accelerator (800m) is the side-coupled-cavity linac, where particles are accelerated to their final energy of 800 MeV. The particle beams from the linac are separated and directed down three main beam lines leading to several experimental area. including pRad, the Lujan Center and the WNR operations area. Operators can control the H+ and H- beams separately, allowing most experiments to run simultaneously.